For 12 years now I have had a Hyundai Santa Fe. I grew to appreciate its long-term dependability and its size - large enough for long cargo, small enough to be manageable. But cars don't last forever and when multiple factory original parts started failing simultaneously it became obvious it had outlived its design life. Naturally I was looking for something similar to replace it. The Santa Fe became unsafe to drive so I needed a replacement relatively quickly. The 2016 Santa Fes had just gone out of stock throughout the country, with the 2017s due in a few weeks. 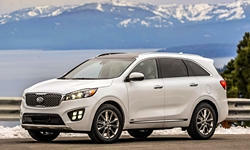 However, its sister vehicle, the Kia Sorento, was still available. It is built in the same plant with the same engine, transmission and mostly identical components by a related company. I found a good deal and financed one. Front view. 220 km on the odometer! Front 3/4 view. Chrome trim around windows is new for 2016. I'm a function-over-form person and I really don't care what the car looks like. That said, the car looks fairly muscular and aggressive, despite the fact that I drive cautiously. The paint, Dark Cherry - a dark burgandy red - was not really my choice, this is the last the dealer had and it was a good deal. White would be my preference - although it shows dirt, it's not easily damaged by sunlight and it doesn't heat the interior. The paint does look more luxurious than I thought, and the chome accents do add a nice touch - those are new for 2016. I never knew the "tiger nose" grille defined the current Kia "look" until I researched and bought this car. It looks massive on this vehicle and bulges out a little bit. This car is very easy to drive. The 185 HP, 2.4 L 4-cylinder doesn't have the buttery smoothness and effortless acceleration the 173 HP 2.7 L V-6 on my old Santa Fe had, but with a little more noise and a little pedal, it can certainly get the job done accelerating up to speed from an onramp. On paper it's actually more powerful than the older V6, but its peak torque is obviously reached at a higher RPM. With more gentle acceleration and at cruising speed, not only is the engine quiet, the entire car is quiet. Eerily, unusually quiet. It's almost like I have to check my surroundings to see if I'm moving, because I neither hear it nor feel it much. Apparently Kia is using their own steel to produce this vehicle and are using more high-strength steel than in comparable vehicles. The vehicle feels rigid, solid and strong. There are no creaks or rattles, just a light wind noise. When I first drove a demo I was disappointed in the steering. I like road feel and current vehicles with electric steering just have no road feel. Even worse was the fact that the demo wandered a little at speed. I chalked it up to me being inexperienced with electric steering and thought I'd get used to it. Well after only 200 km I feel used to it already. It is really effortless and I'm pleased to report my vehicle does not have the disconcerting wandering problem the demo I drove did. The brakes are excellent. This is my first vehicle with ABS - back in 2004 this was an expensive option - and the brakes in this vehicle perform very well. They don't aggressively grab with what feels like 1/2" of travel like some other new vehicles but they do stop evenly, progressively and firmly the harder you push the brake pedal down. There is no tendency for the nose to dive down during harder braking - I presume this is the electronic brake distribution making both the front and rear wheels slow at the same rate. The brakes offer a good degree of control and don't present any surprises. I remember my first experiences with the Santa Fe, the vehicle felt very heavy when stopping and tended to have a longer stopping distance than I expected. Not so with the Sorento at all. Heated front seats - I haven't tried these, it's June and I won't be needing these until at least October. Hill Assist Control, which keeps the brakes applied for up to 2 seconds when they're released on a hill before the driver presses the accelerator. Electronic Stability Control, which applies brakes on individual wheels and alters engine behaviour when the vehicle is not going where it is being steered. These are in addition to features that are now standard on all new cars - ABS, electronic brake distribution and traction control, but are new to me. There's also a spoiler and "eyebrow" LED marker lights, just a style thing. Safety-wise there is an occupant-sensing passenger airbag, side airbags and curtain airbags in addition to the driver's airbag. If the relatively sophisticated trip computer is to be believed, and I will be checking this, the fuel economy is very good, much better than my 6-cylinder Santa Fe. So far on the first tank I am averaging 8.4 l/100 km, probably 60/40 city/highway driving. That is better than my Santa Fe has ever done even with 100% highway driving. This also includes the probably rough driving it was subjected to when loading and unloading from car carriers and the 20 km PDI road test. The computer also customizes things like locks, lights, maintenance reminders, etc. I probably won't be interacting with it much aside from right now, but it is a nice convenience that makes the car feel more like it's mine. There's a lot of interior space. It feels very roomy. There's lots of empty space in front of the driver, which I also experienced in a Toyota Venza and it leads to a comfortable feeling of airiness up front. With the rear seats folded down, there is a lot of cargo room. It definitely seems larger than my old Santa Fe. The rear seats fold down almost perfectly flat and leave no "lip" which was a problem for loading long cargo in the Santa Fe. As well, if the front seats are pulled up just a bit, the headrests can stay in the rear seats when folded down. It's only when the front seats are all the way back that the rear seat headrests need to be removed when folded down. Even though I'm a bit taller than average height, the driver's seat does not need to go back far enough for this to be an issue for me. Speaking of front seat adjustments, these can go back very far and would be great for tall people. In many vehicles I have to move the seat almost all the way back, here it still has a fair amount to go. The rear seats fold down very easily just by folding the seat back forward on top of the seat bottom. Very simple. On the old Santa Fe the seat bottom needed to be pulled up and forward, then the seat back folded down, which led to a barrier right behind the front seats. As well, the headrests needed to be removed and stowed somewhere, usually on top of the "shelf" the rear seat bottoms formed when folded up. Not so in this vehicle, which is quite convenient and is great for increasing cargo space without increasing vehicle size. The seats are comfortable and should be fine for long drives. They are fully adjustable. This version is all manual except for the lumbar support, which is powered. The visibility is worse than the Santa Fe. Front visibility is very good, but rear visibility is slightly compromised by the smaller window and the fact that the spoiler obstructs visibility at the top of the window. It's still fine for me though. It's the side visibility that's the largest problem. The solid portion of the door ends higher so the window is not as tall. This isn't a problem on the driver's side, I can still shoulder check, but checking for short vehicles on the passenger side is problematic...exactly the sort of vehicles that would be passing you on the right (sports cars). I corrected this by raising the driver's seat so I can see from a higher angle, it seems better now. In everyday driving I appreciate the steering wheel audio system remote and the Bluetooth connectivity, again standard in most new cars. The Bluetooth system works perfectly for audio for me. I couldn't get the phone audio to work at first. I searched the Internet, tried dozens of things, and finally fixed it by simply restarting my phone. Under the hood, things are so simple that there really isn't much to see. The engine and, surprisingly, even the radiator are shrouded. The old hydraulic power steering system is eliminated completely, with its associated reservoir, piping and proportioning valve - this system needed several repairs on the Santa Fe, but is replaced by column-mounted electric power steering, inacessible and not visible from the top. There's the reservoirs for brake fluid, windshield washer fluid and coolant as well as the radiator cap, dipstick and oil cap, but that's about it for user-serviceable items. The air intake is connected to the shroud over the radiator and takes in cool air flowing over the top of the radiator. The air duct sits right on top of the battery, an odd arrangement. The air filter is right up top and fully accessible, a change from my Santa Fe where one left clasp was blocked by other parts. I keep my vehicles a long time and expect them to be reliable for 10 years or more. My 2004 Hyundai Santa Fe did not let me down, and the new Santa Fes have the same reputation for quality and reliability. This Kia Sorento seems the same from the research I've done, and it should as it shares the same engine and transmission. Time will tell, but I'm hoping this vehicle serves me well for a long, long time.